The Women, Peace and Security Challenge quilts were part of a larger exhibit at the United Nations’s Visitor Center in New York, which is accessible to 2000 plus visitors, UN staffers and diplomats every day. The Advocacy Project and the White Ribbon Alliance for Safe Motherhood also contributed quilts to the exhibit, covering moving topics related to women such as uterine prolapse, sexual violence in conflict, discrimination against Roma in Europe and a pair of quilts which contrast the Masaii traditions of female genital cutting and early forced marriage against the benefits of education for girls. A quilt from the White Ribbon Alliance talks about a young woman who died after giving birth. 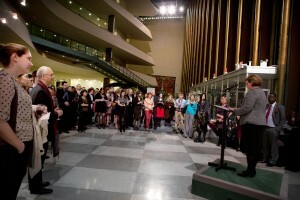 Dr. Babatunde Osotimehin, the Executive Director of UNFPA, opened the exhibit to a gathering of 250 diplomats and visitors on International Women’s Day. 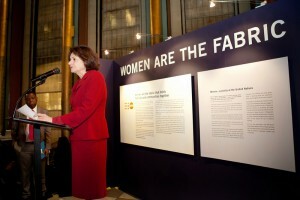 Ambassador Rosemary DiCarlo, Deputy Permanent Representative of the U.S. to the U.N and Margot Wallstrom, the Special Representative on Sexual Violence in Conflict, also spoke. Ms Wallstrom spoke of the women textile workers’ strike in Massachusetts and read the lyrics from the song, Bread and Roses. She was followed by Marceline Kongolo, Founder of SOS Femmes en Danger from the Democratic Republic of Congo. Click here for the press release of this event.